← The yellow is there – just need to process properly! I thought I’d take a break from the usual Orion object this month and instead present just a single star image. This month’s object is the star Aldebaran, the eye of the Bull in Taurus. If you had a much bigger field of view you could capture Aldebaran and the whole of the Hyades star cluster as well – there aren’t too many good images of that lot about. 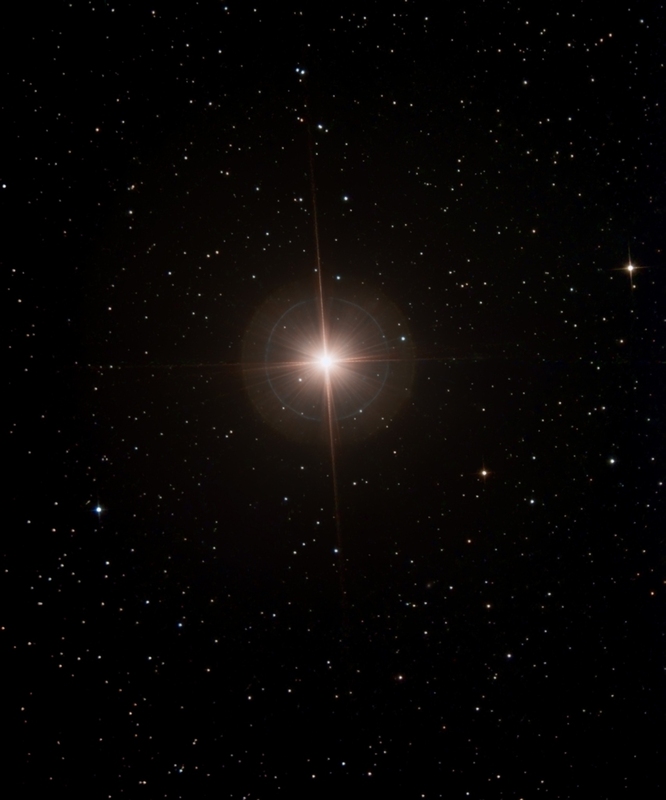 However, returning to Aldebaran, what makes it nice and interesting of course is that there is some colour associated with this star. 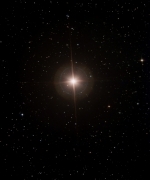 Aldebaran is a red giant lying just 68 light years away. Aldebaran has a diameter 38 x that of our Sun and it shines with 150 x the Sun’s luminosity. Being so bright means there is very little effort involved in imaging this one, and it’s more a matter of how your optics reproduce a bright point source. This image was taken with the (highly) modified original Hyperstar and the little H9C one-shot colour camera. The four cables coming out the back of the H9C lead to the diffraction spikes from the star (the splitting of the spikes is due to the cables not coming out at precisely 90 degrees to one another) – there has been no addition of software spikes to tidy this image up. In addition there is an array of fine spikes close in to the star as well as an outer halo probably caused by the outer round aperture I used to use with this kit. I made up an aperture to go around the edge of the C11 taking the aperture down from 11″ to 10.5″ (with the speed of the Hyperstar this loss of aperture made no real difference to my imaging times) – but what it did do was to considerably sharpen up the stars – I guess there might have been a little bit of “rounding” of the mirror edge? The edges of the lenses of the Hyperstar were blackened with matt black paint – otherwise there would have been a terrible lens flare to deal with from such a bright source.